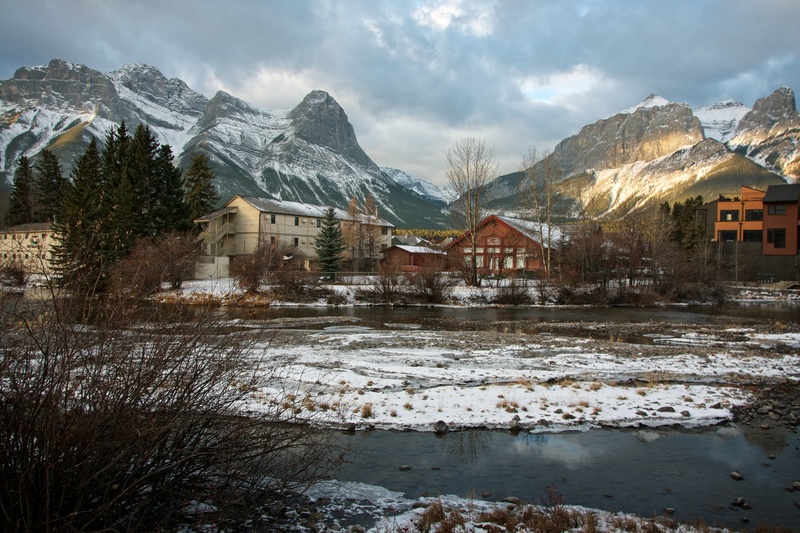 Ha Ling Peak (centre left) on a November morning from the Town of Canmore. I love conferences, especially when I get to go as a spouse and don’t have to attend or present anything. In fact, some people might even call this a vacation 😉 So while Melanie toiled away at a two day school administrators’ conference in Canmore, I had a few hours to myself on Friday, November 21st, and decided to make the most of it. After spending the previous night in Calgary, we enjoyed our morning drive to Canmore. Once I dropped Melanie off at the conference centre for her first session of the day I was on my own. Hmmmm, I’m in the mountains, what to do? What to do? 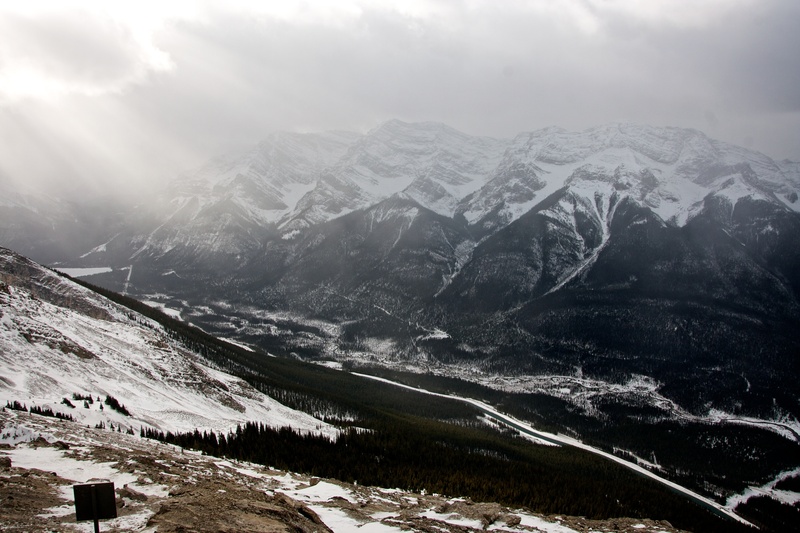 Knowing that my time was limited, I narrowed my hiking options down to three possible quick hit destinations: 1) Heart Mountain & Grant MacEwan Peak; 2) Ha Ling Peak & Miners Peak; or 3) the East End of Rundle (EEOR). The thought of being able to bag two peaks in one shot is always appealing and given the prominence of Ha Ling and Miners Peak over Canmore, this was my first choice, though I did end up flipping a coin after I had geared up in the Goat Creek parking lot because EEOR looked really fun too, but Ha Ling and Miners won the toss. 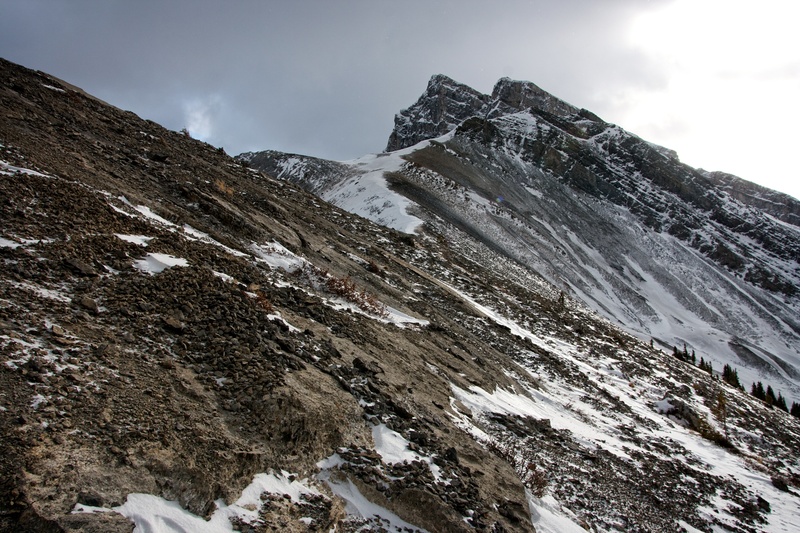 Ha Ling Peak is roughly Canmore’s equivalent of Bear’s Hump in Waterton and on any given day, dozens of people make use of the trail. That being said, on this particularly windy day, I only encountered a half dozen people on the mountain and even had the trail to myself for a brief period of time. I did find it interesting that everyone who I talked to said that they did not plan to make the short trek over to Miners Peak. Given that it is such a short trip over from the summit of Ha Ling I was surprised by this. 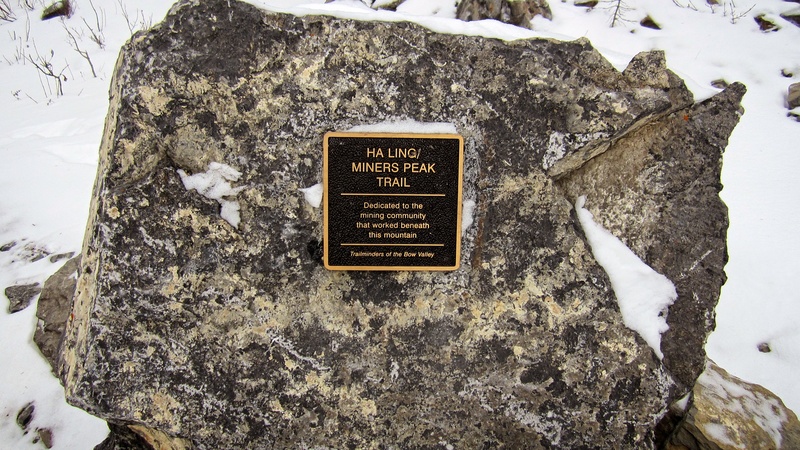 Formerly known as Chinaman’s Peak, Alan Kane notes that the summit was officially renamed in 1998 “to honour the Chinese miner who first ascended it back in 1886. 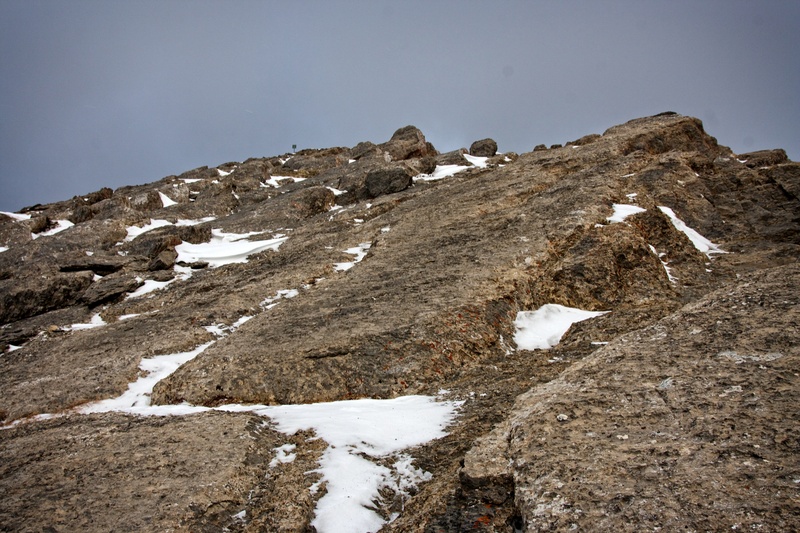 Ha Ling was reputed to have made the round trip on a bet in six hours, and when skeptics couldn’t see his summit flag, he made the ascent again with witnesses firmly in tow” (Scrambles in the Canadian Rockies, second edition, 82). 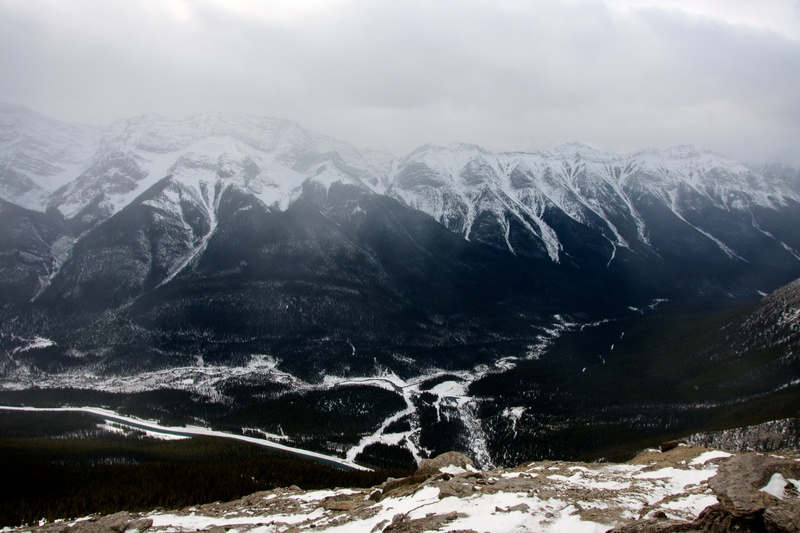 From a historical perspective I find this story fascinating as it would appear to support the presence of a non-white, non-European male involved in a form of recreational mountaineering in nineteenth-century Canada. There has been some excellent work done on the role of white women in the ACC at the turn of the 20th century, but I think I’ll have to investigate the story of Ha Ling further. It might be a one off, but it is definitely an interesting story. I also find it interesting because there are not many mountains in Alberta named after non-white people, including the First Nations. My GPS continues to do weird things and I’m not sure where the sharp little dip at the beginning of the graph comes from because it is not reflected in reality. In my route map it also shows that I deviated off of the trail and through the trees at one point, and I didn’t do this either. 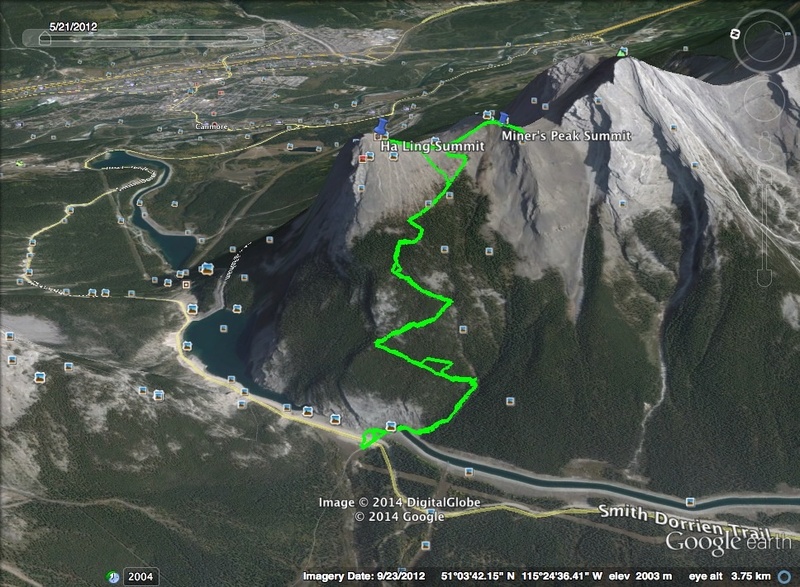 Anyway, Ha Ling Peak and Miners Peak have to be two of the quickest two peaks that I have ever done. From the parking lot to the summit of Ha Ling it took me 1 hour and 20 minutes. 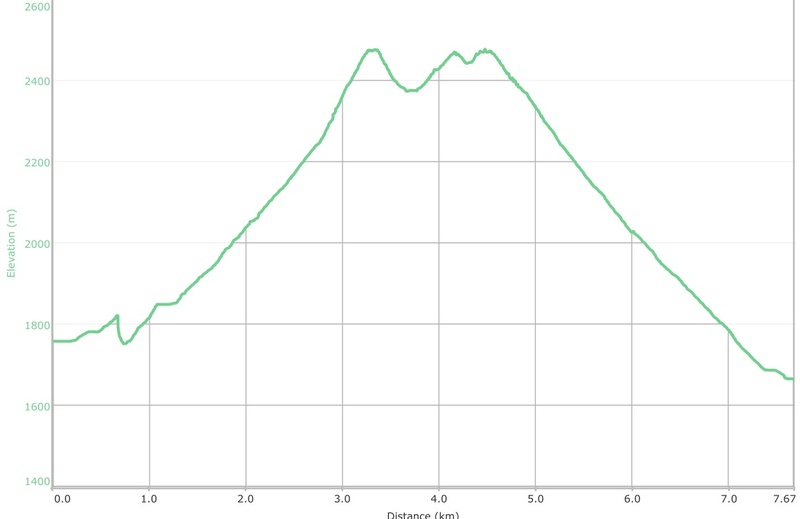 Total elevation gains for the day were 913m and the total distance travelled was 7.7 km. 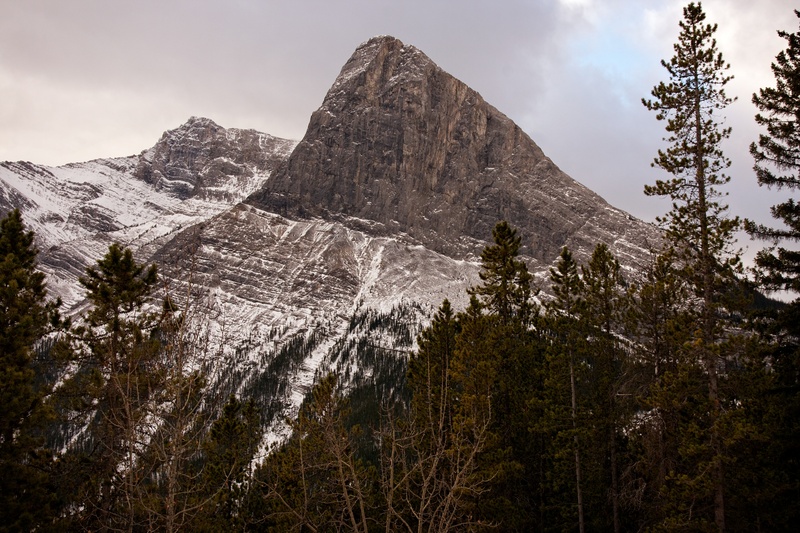 Ha Ling Peak from the Spray Lakes Road. 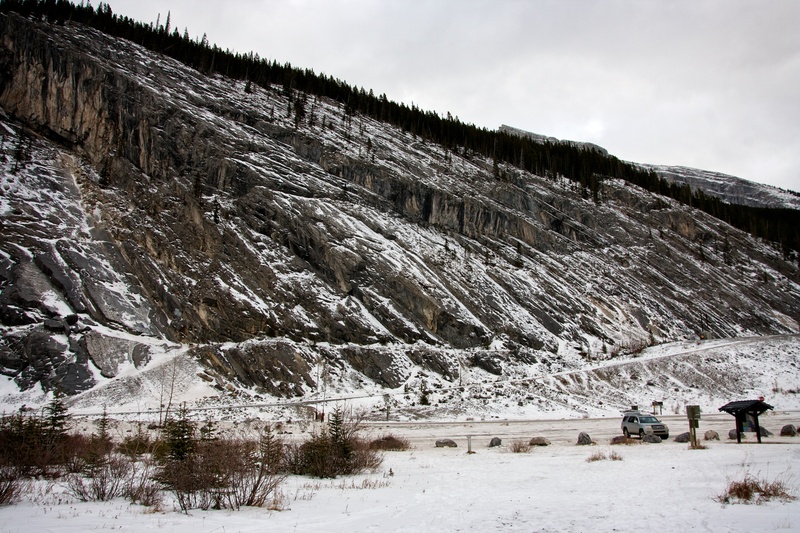 It was 10:30 am on a Friday morning in late November and I was the only one in the Goat Creek Parking lot. This wouldn’t last. 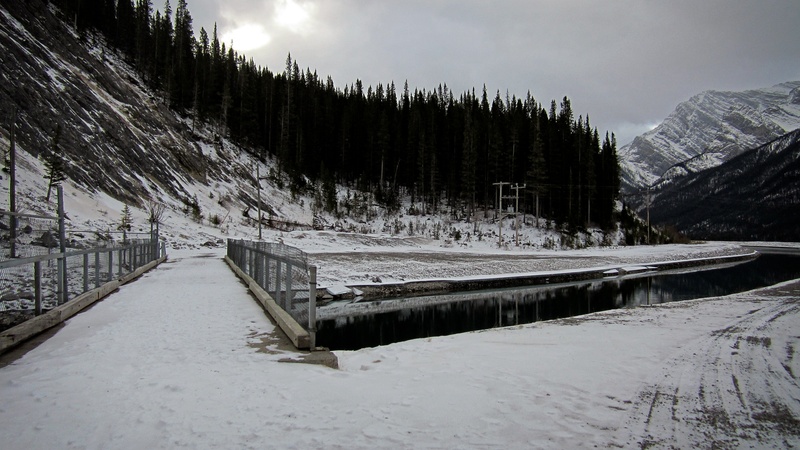 The trailhead lies on the other side of the canal behind the double power poles. A plaque marks the location of the trailhead. 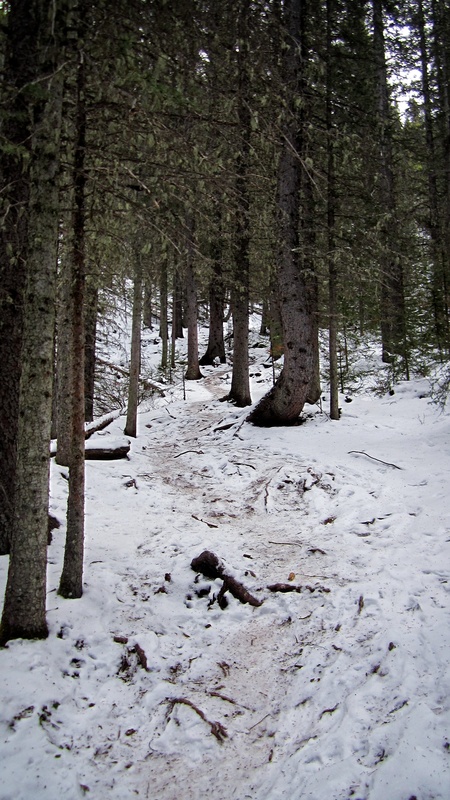 The trail is extremely popular even in the winter. I found myself alone on the mountain for only about 20 minutes before I was passed by a trail runner wearing compression clothing and a small hydration pack. We chatted briefly before he hustled ahead of me up the trail. 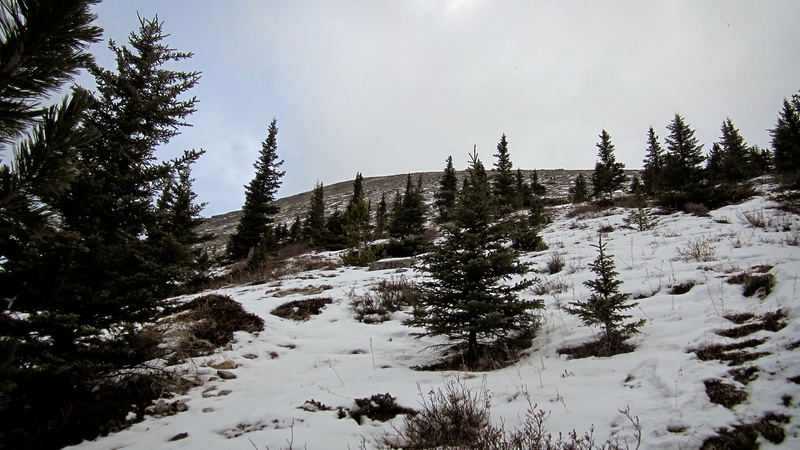 I didn’t see him again until I was just starting up from the tree line and could see him descending from the summit. It took me 45 minutes to reach the tree line from the parking lot so he must have summited Ha Ling in under this time – wow! 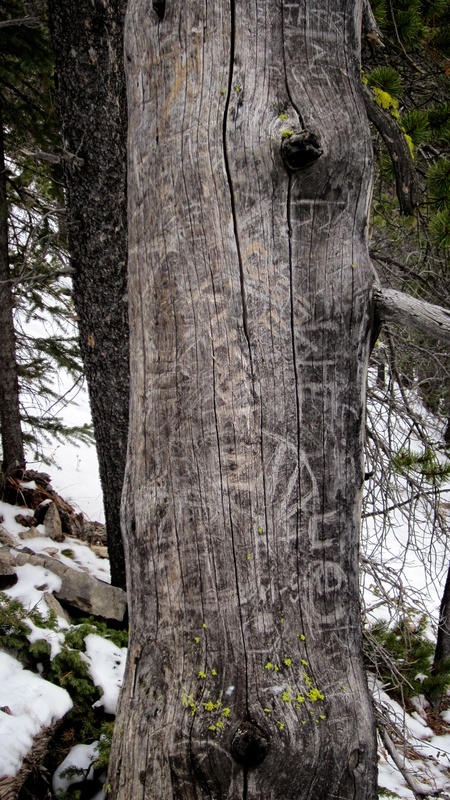 The names and messages carved on this dead tree testify to the trail’s popularity. After 45 minutes of hiking, I finally got my first clear view of the summit. For entertainment reasons only, here is where I left the trail and went straight up the slope. 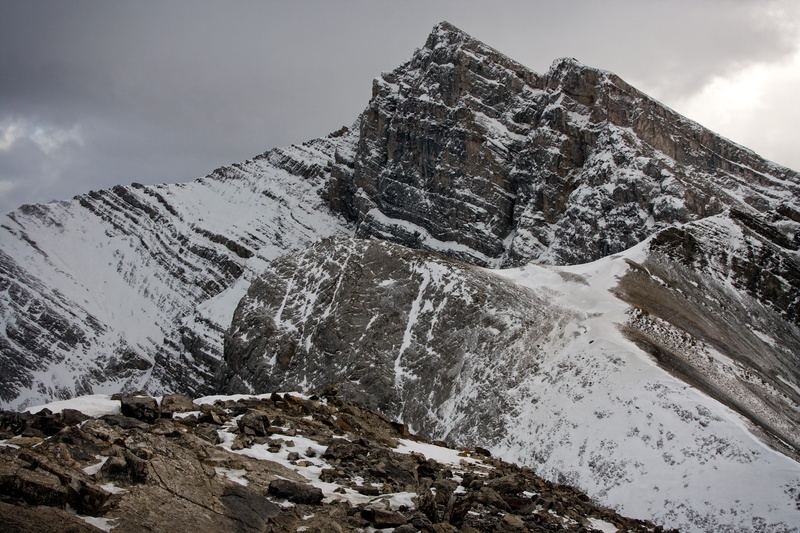 Looking southeast towards the summit of Mount Lawrence Grassi from the slopes of Ha Ling Peak. Miners Peak is also visible on the left. Nearing the summit. There are two signs on the top of Ha Ling Peak that remind people not to throw rocks or other objects off of the summit because there might be hikers or climbers below. 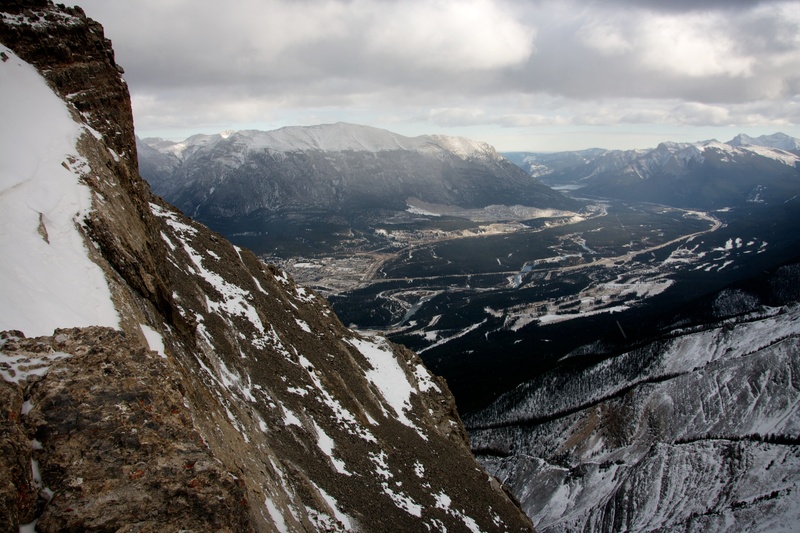 Looking down at the Town of Canmore from just below the summit. 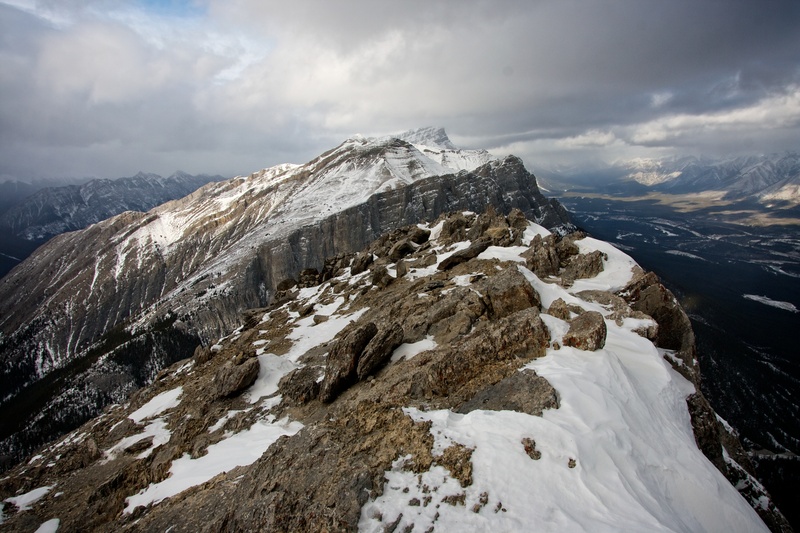 Looking northwest at the East End of Rundle (EEOR) from summit of Ha Ling Peak. The view to the east. Grotto Mountain is on the left. Mount Lawrence Grassi dominates the view to the southeast. Miners Peak is in the foreground. The sun pokes through the clouds as I look to the south. Looking southwest towards the Goat Range. The Goat Range continues to fill the view to the west. One last look at EEOR. This was my alternate objective for the day and save for a coin toss in the parking lot, I would have been standing on its summit and looking back at Ha Ling Peak. 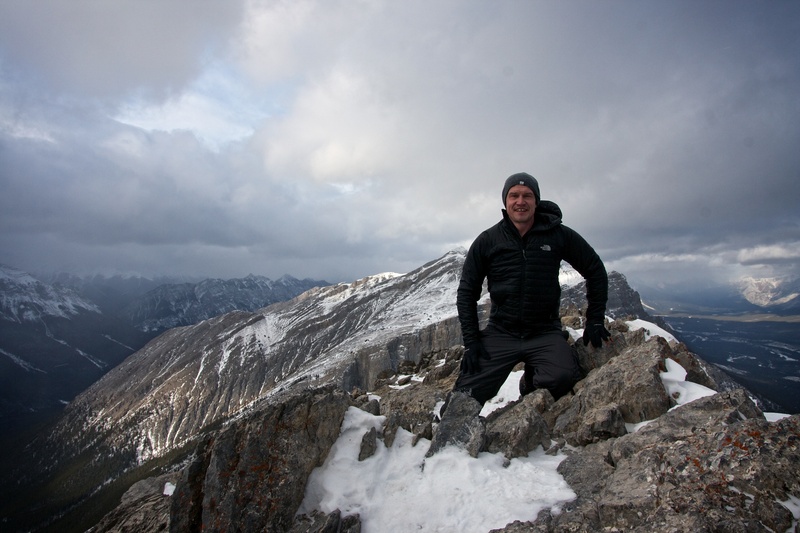 I take my place among the multitude of others who have stood on the summit of Ha Ling Peak. 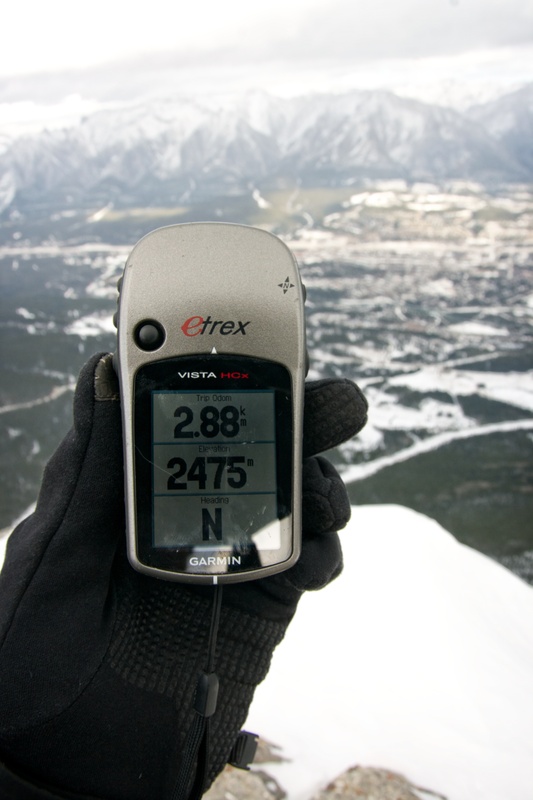 My GPS reading on the summit. 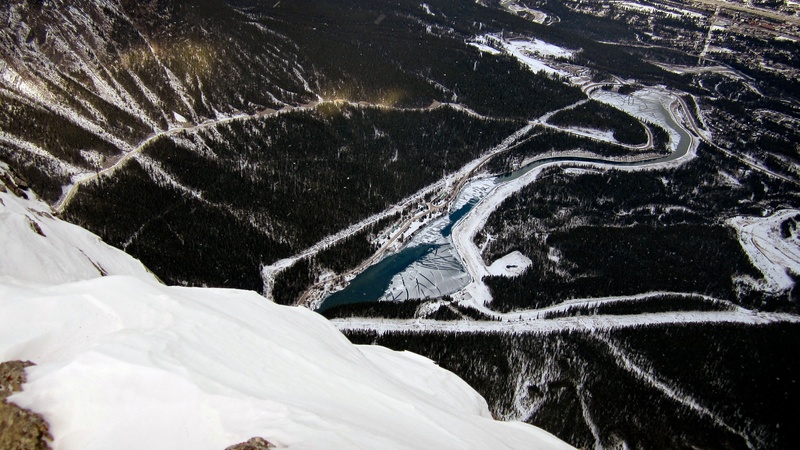 Looking down from the summit at a reservoir located on the edge of Canmore. 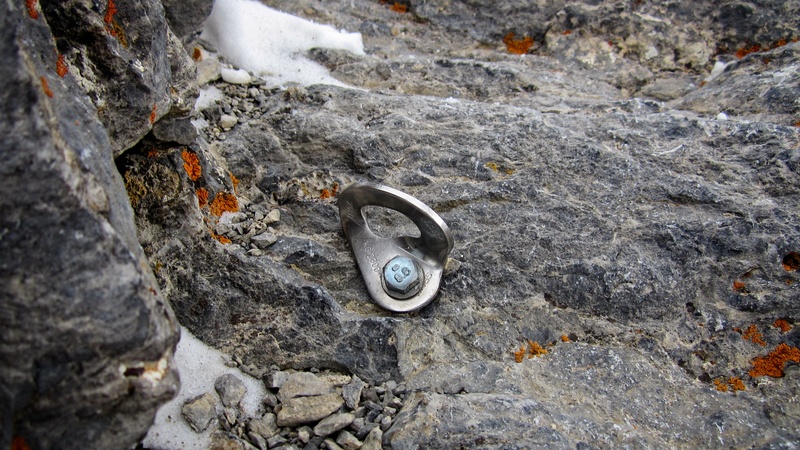 I couldn’t find a cairn or a register on the summit, but I did find this bolt hanger. After summiting Ha Ling in just 1 hour and 20 minutes, I was compelled to head over to Miners Peak (foreground centre) and then to the highpoint that can be seen in the foreground right. Click to continue to Miners Peak.